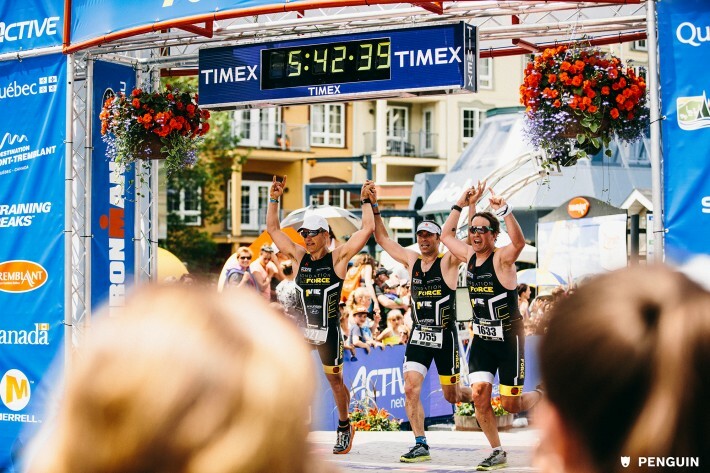 This Sunday August 16th, 2 500 athletes will swim, bike and run for up to 17 hours in the hopes of completing one of the toughest feats of endurance out there: the IRONMAN. Every year we hear incredible stories of strength and determination come out of this event, and this year we wanted to share one with you. 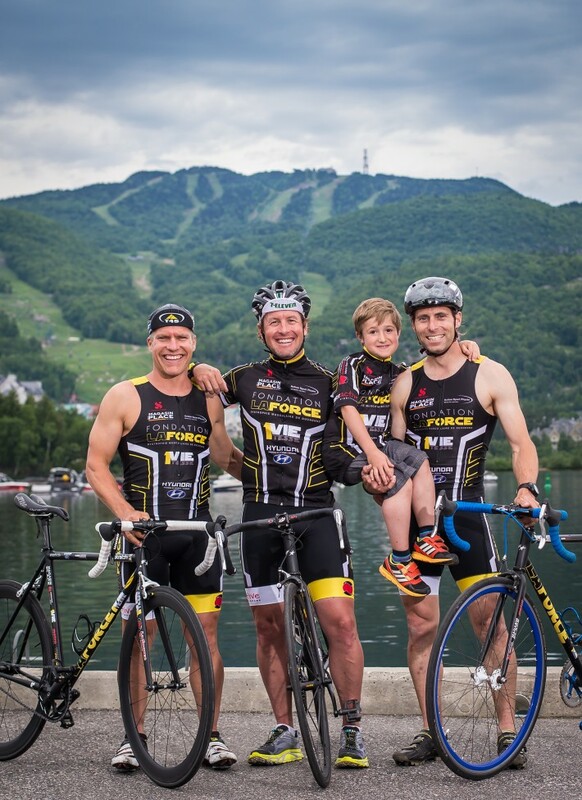 Living, working and training in Tremblant, Steve Deroy, Patrick Lussier and Daniel K. Cooper are local athletes who truly make the most out of the playground we call home. Riding under the banner of team 1VIEtesse for La Force, they have added an extra challenge to their IRONMAN race. 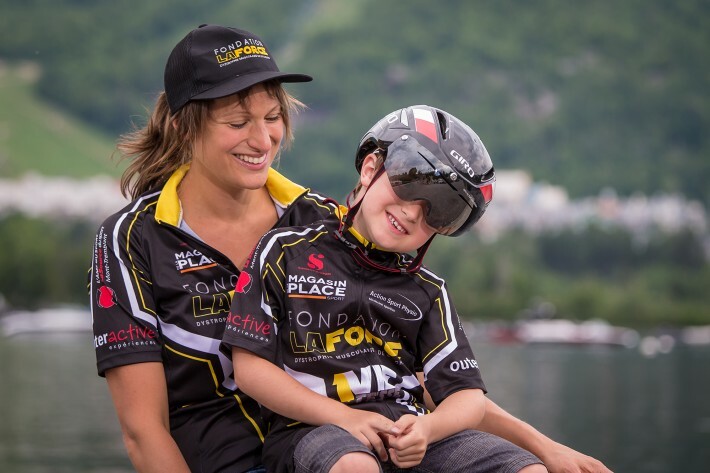 In order to raise awareness for La Fondation La Force, they will each ride the 180km bike portion on single speed track bikes. With the big race coming up this weekend, we sat down with team member Daniel K. Cooper. Speaking on behalf of his teammates who are busy right now with jobs, families and last minute preparations for the event, he spoke to us about their training, experiences and objectives. What is Tremblant to you? Tremblant is our home, and we are proud to live in and share in this community. As athletes we all participate in a lot of local activities and practice many sports that the region really caters to: road cycling, trail running, mountain biking, skiing, ski running (rando skiing), stand up paddle boarding, climbing, open water swimming, orienteering and of course triathlon. The mountain itself, the beautiful lake and the relaxed environment make Tremblant a real athletic playground. We have one of the best IRONMAN venues out there and we’re super stoked to call the Subaru IRONMAN Mont-Tremblant our home race. Our experience participating in the IRONMAN 70.3 in June was amazing. The crowds, the energy, the atmosphere… It’s so nice to race here. All you hear all day is people edging you on, calling your name and encouraging you. The support of the local community, the wonderful volunteers, the site, all make for a spectacular race. Tell me a bit about your training. Honestly we’re spoiled. We live beside a crystal clear 11 km lake; have hundreds of kilometers of trails and are surrounded by countless hilly roads. Training in Mont-Tremblant is all about variety. Tired of road biking? Hop on a mountain bike and hit the trail network. We get to mix up our training so much it never really feels like training. Paddle boarding on the lake makes for a great core workout. Trail running, especially up and down the mountain works our power and stability. With so many trails, it means that not a run goes by that I don’t see something new. The lake itself is a real plus, with access to open water from May to early October. If you like swimming it is a dream spot as they even provide a secure marked corridor for us to swim in. Next door to us we have the Nordet. 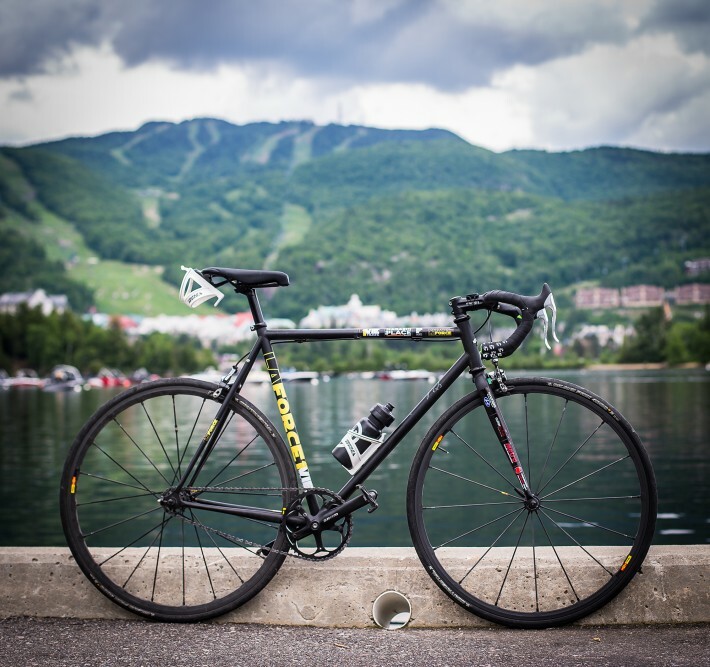 A bike ride out and back to St. Donat, depending on the route, can give you close to 2000 m of vertical! Not to mention the most amazing refuel stops: classic French cuisine, cafes, health food restaurants and markets and the all-important microbreweries! How do you stay active during the winter? By being constantly outside! I rarely run in the winter, and if I do it’s on the mountain trails or on snowshoes. Most of my training is done rando skiing / ski mountaineering. My partners and I never get tired of going up and down the mountain on the well-marked rando trails. We mix it up with skate skiing, cross country skiing, fat biking, ice climbing and of course simply ripping around the mountain on alpine skis. This winter we will even have a new semi-Olympic pool in town, which will be a great spot to train. What other events do you do? As Tremblant boutique-sponsored athletes, we get the chance to share our passion with fellow athletes and locals looking to discover a new sport or simply for a good workout. Pat heads the Salomon trail running club and we lead groups of different abilities on 1 hour runs twice a week. Pat created the 10k, 5k and 1 km Salomon Classic race held in the fall. In the winter we accompany people up the mountain on ski mountaineering equipment. Over the last year we helped in the development of the Festival Rando Alpine. The rando Festival hosts local ski rando races and tours. We encourage people to get out there and achieve their goals in a fun environment. Tell me about your teammates. Pat has always been one of my athletic heroes. His endurance, power, stamina and tolerance for pain, combined with his extensive race history not only in alpine skiing but in endurance racing (read : ECO CHALLENGE) is phenomenally inspirational. It is beyond humbling to listen to his hilarious stories as he passes you, on an 11% incline, barely winded. Steve is my triathlon guru. He helped guide and train me on my road to my first triathlon, and was there to coach me for my 1st IRONMAN in Tremblant in 2013. Guru status was solidified further in 2014 when he raced 3 70.3 IM’s to qualify to race at home in Mont Tremblant at the 70.3 World championships. Drive and passion don’t begin to explain the raw force that is Steve Deroy. What is team 1VIEtess and how was it formed? The team came into form after the IRONMAN season in 2014 and Steve had achieved his goal of racing in the world championships. Pat was happy to have seen the world of IRONMAN from the inside year after year in the operations room, but was ready to get out and experience the stories for himself. I swore I’d never do another race after the 2014 half, but as a volunteer at run station 10 during the 2014 IRONMAN; I had the wonderful chance to pace the last runner to the site. I was so moved by my inspiring companions and the last runner’s strength I decided I was not yet ready to be done with IRONMAN. A call or two was made and we were all there to enroll for the 2015 IRONMAN… the only rule was that we would do it differently. And the single speed bikes? All of us were motivated to show people that you didn’t need a lot of money or fancy gear to do an IRONMAN. We simply wanted to show that drive, passion and dedication was all it took. Pat brought up doing it on single speed and that was it. It seemed crazy, but crazy is always a great motivator. What is the link to La Force? We also wanted it to mean something. As Steve says “1 speed, 1 cause, 1 purpose = 1 desire to help others get better.” Steve is friends with Marie Catherine and Danny. An amazing local couple whose son, Anakin, was diagnosed with Duchenne Muscular Dystrophy (DMD) in the fall of 2013. (see description below) MC through amazing friends, advisors, lawyers etc. created La Fondation La Force to help make treatment available as quickly as possible to the largest number of children, and participate in the advancement of DMD research. Steve introduced us to MC, we heard her story, and we all felt it was a perfect match. We offered to raise awareness and help with donations through our 2015 IRONMAN goals. With DMD you lose over time your force, your muscular strength and we were doing an event that required a whole lot. Here below you will find a video of La Force, Anakin, his family and team 1VIEtesse. It is both sad and inspiring. La Foundation La Force was started by MC (mother of Anakin) and Mireille. Two old friends who work very well together. After Anakin was diagnose with Duchenne muscular Dystrophy, (October 2013) they realised very little action was taken in Canada. Duchenne muscular dystrophy (DMD), is a rare, progressive genetic disorder that primarily affects males. The progression of DMD is relentless – the body’s muscles gradually weaken, leaving boys in a wheelchair by age 12 and with a life expectancy in their 20s to 30s. Children born with DMD do not produce enough dystrophin, an important structural component of muscle, causing muscle cells to break down and die. Some cases of DMD are caused by “nonsense mutations,” which are errors in the genetic code that prematurely stop the production of dystrophin. While there is currently no cure or treatment for DMD, hope is on the horizon for Canadian patients and their families. Ataluren, the first and only treatment to address the underlying cause of nonsense mutation DMD, has been approved in Europe for those patients who can benefit from it. The DMD community [in Quebec] hopes it will soon be available in Canada.